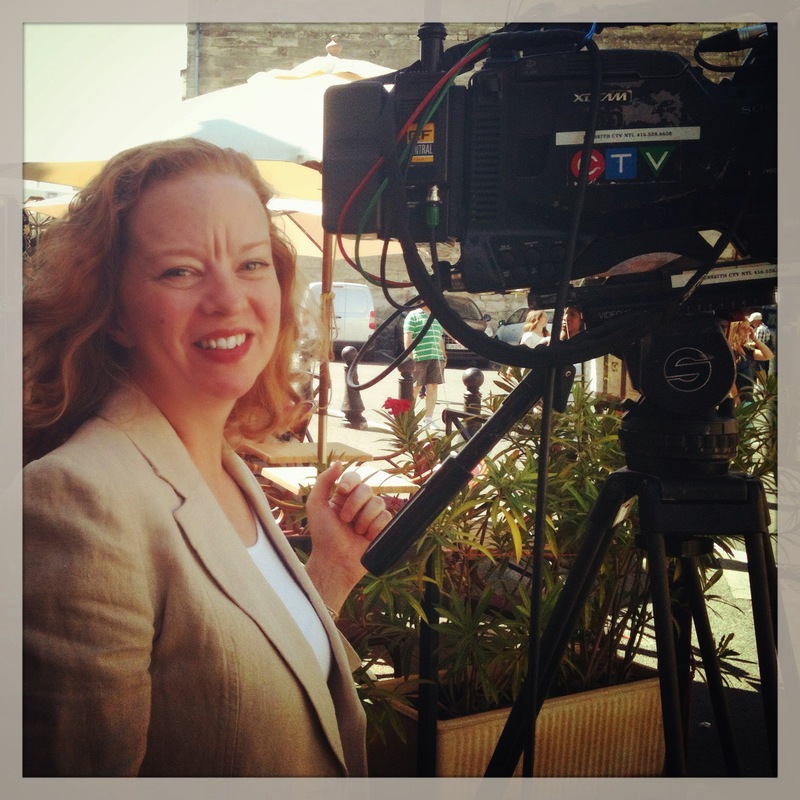 Lost in Arles: "Lost in Arles" found on live Canadian television! YAY! Thanks for doing a post on your experience being interviewed for a premiere morning tv program!!! I can't be the only one of your fans interested in how this went down and wanting to see a clip! It's funny, the notion of a shy actress, but I can relate! But one look at your interview shows us why you were accepted into the very prestigious Yale School of Drama masters acting program - you shine; you've got "it"! (to say nothing of your brilliance in all of the classical roles I've seen you do; that's another blog post!). Though I know you don't write for accolades, I'm glad that your column got you some exposure - who knows what could happen this year? The sky's the limit!!! This is AWESOME Heather - SO COOL! And lovely to see and hear you too! Congrats! A most deserved recognition, Heather! No telling what this could lead to. Most exciting and a nod to your talents!! Congrats! Well done! Your romance is a great story and Arles makes it even more interesting. Well done Robin! Heather, that was a treat....you were so fluent, as if just a chat! Was also a treat to hear you and see you and your wonderful yellow shoes, the perfect touch! Congratulations on being "found" by Canadian TV....and a drink of Rose' to what might come next. Congratulations! You are a star! I love your writing and I would love to see TV travel segments with you hosting them and taking people all around Arles and the other places you and Remi wander to. And, of course the pups would have to be in some of them, and Remi, too! That is so sweet Judi! Thank you!! It’s wonderful to see and hear you. I’m glad the TV conversation affirms and recognizes you and your work as what Arles is, a beauty and treasure in Provence. Congratulations Heather. Wonderful recognition of your beautifully written blog which has enriched the lives of many of us. You are also "a natural" in front of the camera. Bon weekend. You were great. Yay! And I took notice of those espadrilles! Thanks so much for sharing. So good to see you. Waving to everyone from Coeur d'Alene this evening. I've bookmarked this post for further exploration as I'm traveling just now and don't have much internet access. I'm so glad you shared this information! Shine on! Thanks for sharing the link. It was great fun to actually hear your voice after reading your words for years. Bravo! Well done. Have been following along and its always a great break in my busy life. This one was especially fun. Carlos saw you around your move, I know you were swamped. Other Lost in Arles trivia....did you know you are seen in street view of Google earth with your pooches? I hope you are settled and your water is running clear. We bought the Jute espadrilles with laces the first summer...I can only get away with the sky blues in France, the other two pairs are in Vegas. Neat to see my bathroom in your moving pics now broadcast in Canada. Small world, rose colored contacts....Embroiled in the legal drama here from last May's mishap in Arles. We have also described Arles as a living theater set, verbatim. Making a brief visit after the next Feria and will call this time if okay. You radiate! This is wonderful. So pleased you said YES. Judi of Little House suggests you could do travel segments with the puppers. Networks, please take note! That is a lovely thing for you to say and I am grateful for it! And in the second interview I mistakenly spoke a word of French -- oops! Your sister is right! You should share this wonderful news with us! Congratulations. I'm so happy for you. Thanks to your sister who promoted you in that way and who revealed the interview to us! Who else should talk about Arles on the Canadian TV if not you! It only makes sense. And you in front of the camera makes sense too. Of course it would not have fit your sublime attitude to promote yourself here although you could have done that. That would have made sense too. In your place I would have had a blackout in front of the camera! Wonderful! That was a really fun interview, and I could not help but notice the shoes!! I am also shy...and an opera singer....if you can believe that! I so envy people who can be at a party and break into song; I can never do that! I can't think of something to sing, I forget all the words, I can't choose a key....oh it's endless. So much easier when I am on the stage in front of 3000 people. Good for you for trying something that scares you, and hitting it out of the park! That completely makes sense to me too. Even when it is just your friends and they would only be cheering you on! We are odd birds, Rebecca, let's face it. :) And what is crazy is that I was pretty fearless when I was acting - Naked at the end of the Dance of the Seven Veils? No Problem! Thank you for the sisterly pressure Robin, and hourray Heather!! It was lovely to get to hear you speak and see you move after years of an imaginary voice reading your poetic words. So glad you overcame your shyness to share your presence with us. Many wonderful wishes for your 45th year to continue on with happy surprises! Oh my goodness Aurelia (such a beautiful name! ), you have moved more than anyone I have ever heard! That is incredible!!! I hope that you are happy and well installed where you are now. And each of your wishes and words were more lovely than the last...thank you. Heather, you did an incredible job - you're such a natural. I must admit that I scrolled down to see if you were wearing espadrilles. Love them! Thank you for sharing this piece with your fans. You rock! Hehehe yep had to wear the espis - and was ready to premote Jute if they asked! We watched the clip......such fun! You came over so wonderfully well. Relaxed yet passionate about everything, this is just the person we have come to know and admire. A great advertisement for Arles and, we are sure, a most exciting experience for you! Oh, my Gawd, Heather! How much do I love this?!?! Thank you so much for linking the clip. It is such a wonderful thing to see you 'live' and 'in action!' It made me feel this much closer to a cup of actual and not subliminal coffee with you. Heather, I really, really appreciate this post. Just lovely. If that is the case then I am super grateful that I shared it. How I would like to have that coffee one day...my Suzahmahtoozle. You were great Heather and it looks like you had fun. Oh, and you don't seem so shy. I doubt I would have had the courage to talk live in front of a camera. So happy your sister twisted your arm to share your CTV interview with us! You are so very at ease as the camera rolls...such a natural and a charming ambassador for Arles! It is nice to be able to put a voice to your written words! With the sepia toned shades of Autumn quickly approaching, I look forward to seeing your new surroundings bathed in Autumn...and the pups, of course! Uh oh, I think that I promised you a post on the pups already - I need to get on it! Great interview! Enjoyed "seeing" you on TV. Wowee! Congratulations! Oh Heather I feel exactly the same about acting as I am quite shy myself. I have also vowed to myself to continue to do things that scare me! !